I was pretty happy to be on my way this morning. I was truly heading home. 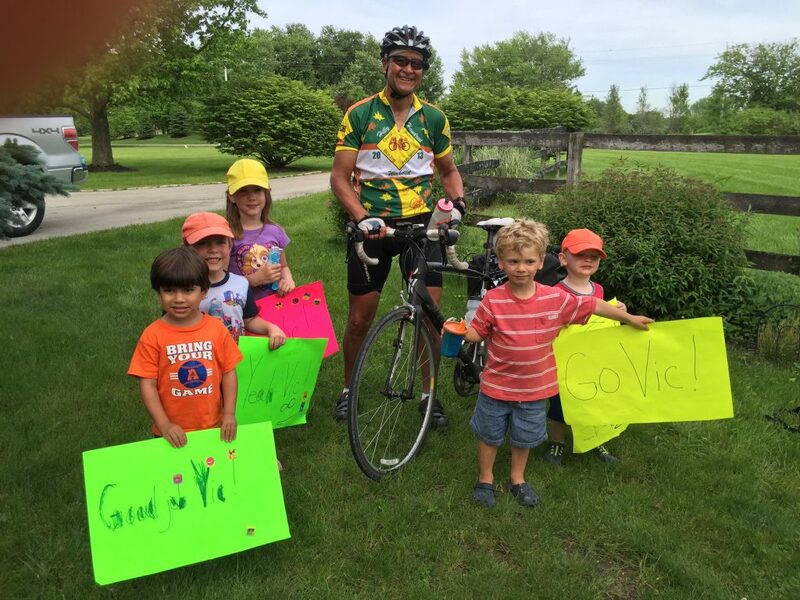 My wife, Becky and a few friends would be waiting for me at the end of the day’s ride. The breakfast in the hotel was pretty bad. I had heated a grocery store frozen breakfast sandwich in the microwave. By the morning, it was already thawed, since I didn’t have a fridge or ice. The orange juice I bought the night before was a little warm. Add a banana and it was my breakfast of champions. Not that great, but enough to get me through the first miles to the next town, Covington. The Four Seasons had popped up on the mental jukebox with “Working My Way Back To You”. 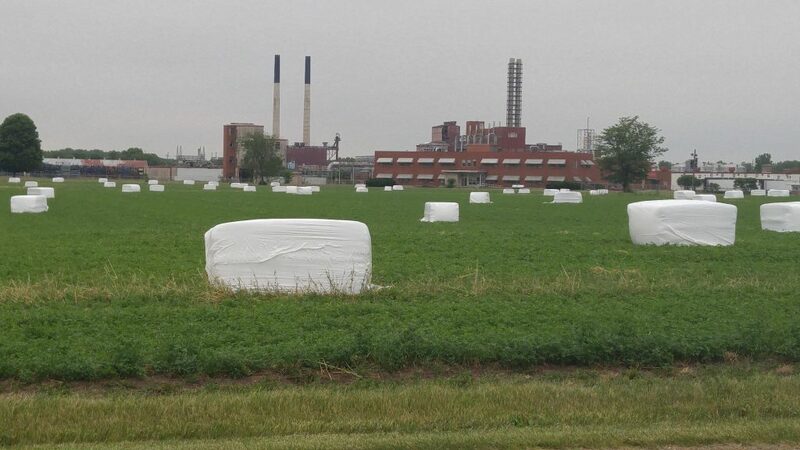 When Mike and I had passed this factory in Covington the night before, we couldn’t figure out what these things were – Invasion of the Body Snatchers?? Definitely one of the better “Welcome To” signs I had seen. When I did get to Covington, it was only 5 miles down the road. I didn’t think it was worth stopping. Veedersburg was only another 8 or 9 miles. The skies were overcast and the threat of rain was strong for the early afternoon, so I pressed on. There, I made a quick bathroom break, got a milk and a donut. I was still in a bit of a hurry. 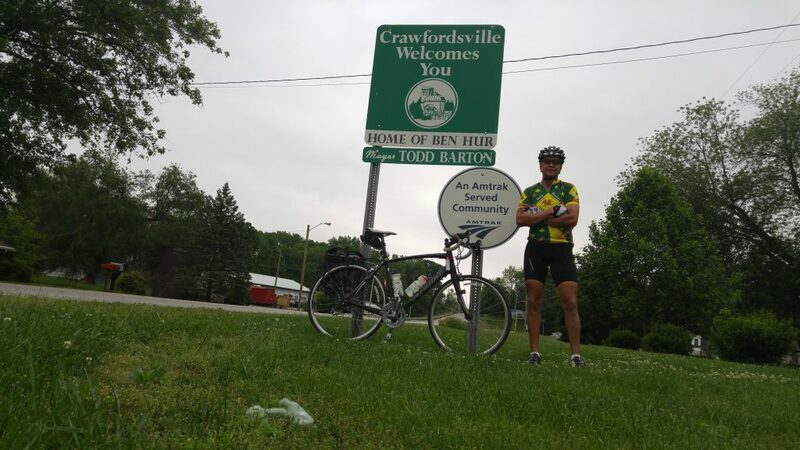 The major town of the day was going to be Crawfordsville, another 20 miles down the road. 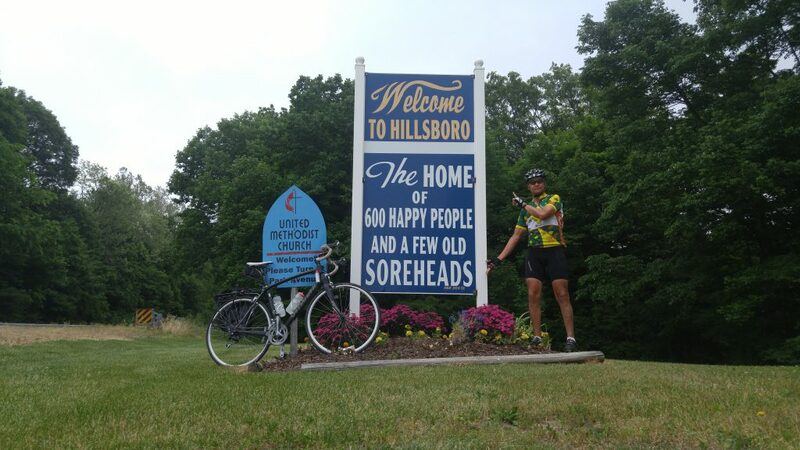 I kept a steady pace through Hillsboro and Waynetown. Both were small, but big enough for me to get a snack and a bio break if needed. In Waynetown, I saw a bench off the main intersection of town. I had been working on my trail mix and water. The skies were still dark and the wind had picked up some. I checked in on my phone with an app called Life 360. I had learned about it from a motorcyclist way back in Southeastern California when I was crossing the desert. It basically sends a geographic checkpoint to anyone in your defined circle. My defined circle consisted of Becky. As soon as she received it, Becky gave me a call. She thought that I must have stopped if I had taken the time to do the check point. As always, she was right. Becky told me to check the weather app, weather underground. It provides lots of data about expected temperatures, wind direction, and a quick radar map of the area. A monster was growing from the west and was following me. It was at least a 25 mile front of green, yellow, and red on the radar indicating I was going to be wet soon. 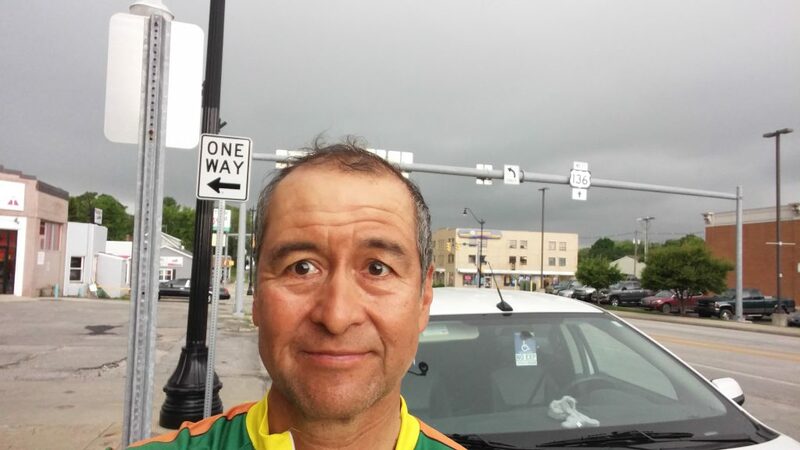 I quickly got back on the bike and started pedalling for Crawfordsville, yet another 10 miles down the road. I always try to search for a non-franchise place to eat. 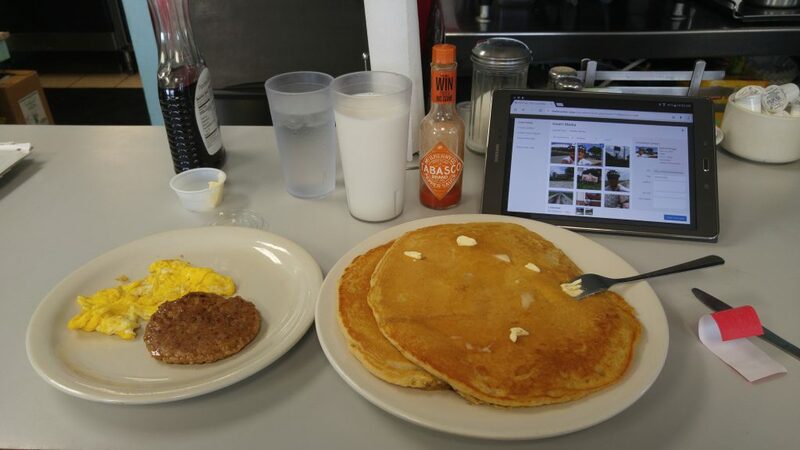 After doing my city limits picture, I searched google and found Blondie’s Diner. It looked like it would fit the bill. It was along my route and when I found it, I saw a sign that said it had free wifi. While I waited out the storm, I could upload pictures and even a video for yesterday’s blog. Of course I ordered second breakfast. I asked how many pancakes came in a short stack. I was told, “two”. I added an egg, sausage patty and a glass of milk. When it came, the pancakes may have been short, but they were wide. I needed a cup of coffee to finish them off. It may have been the home of Ben Hur, but I didn’t see Charleton Heston anywhere. The sky soon turned very dark. The menacing front had finally caught up with me. Hidalgo was safe outside, underneath an overhang. While I slowly tried to conquer breakfast, I took advantage of the wifi. Fifties music played in the background while I uploaded pictures and a video to yesterday’s post. I had the connectivity I couldn’t get at my hotel last night. 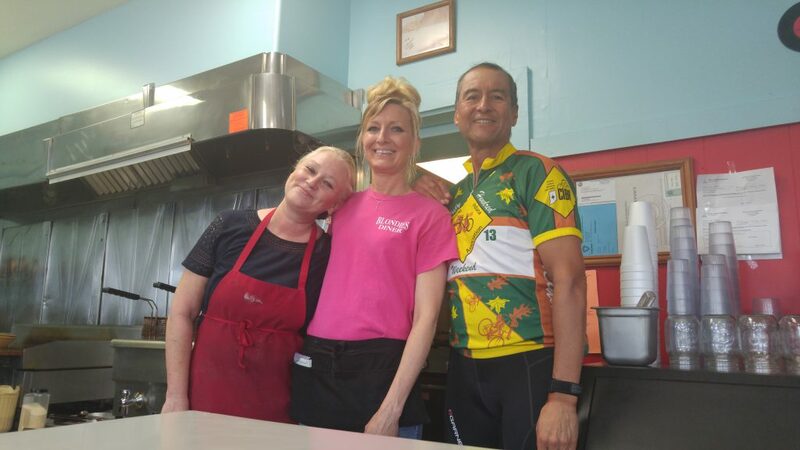 I also could monitor the weather and over the next 2 hours, I enjoyed conversation with customers and staff as well as the owner – the real Blondie! It was a great place to hang out, especially in a storm. The rain did finally stop. The roads were still wet, but I wanted to make up some time. Blondie and company (They’re not just an 80’s band, you know) sent me off with full water bottles and well wishes. I was checking google maps often to find the best way to cross I 65. Having driven it many times in this part of the state, I didn’t want to take SR 32. It had good pavement, but no shoulder and could be heavy with traffic. The next alternative required me to meander down county roads and cross I 65 at the Whitestown exit. For the most part things were smooth. The wind was mostly a cross wind. I hit a small section on my path that meandered into a gravel road. I put up with it for less than a half mile before I returned to pavement. Google suggested a more direct diagonal path further down the road. When I got to the turn, it was paved, so I kept going. Unfortunately, almost a mile down the road, it was pavement heading west, but in my direction east, it was gravel. I gutted it out for about 3/4 of a mile and came to a cross road that was paved. The pavement would take me back north more than a half mile, but then get me to guaranteed pavement. The diagonal, shorter path was ahead and gravel. I took the longer route because it was getting too hard to navigate the gravel on my 700×25 tires. Without a functional bike computer, I had to stop, pull out my phone, and check the map and location multiple times to make sure I hadn’t missed a turn. This slowed my progress home. I was still far away enough to be unfamiliar with these roads. I finally got to my final turn before I 65. The road paralleled the interstate and I made good time. The mental jukebox had switched to an early Grand Funk tune – “I’m Your Captain (Closer to Home)” and it pulled me along. Becky was going to meet me at a friend’s home, along with some of our church small group. I had ridden past Tom and Bonnie Edgerton’s home many times, but not from this direction or path. I was zipping through Zionsville so fast, that I missed a turn I was not familiar with. When I stopped to check my position, I found that I needed to add yet another mile to get back on track. I was still feeling strong as the excitement of seeing friends and family kept the legs pumping. 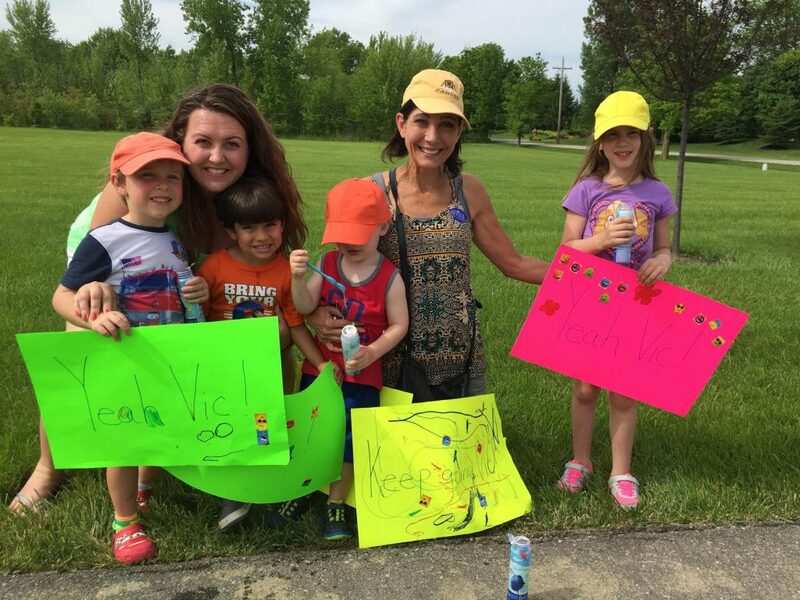 It was great to see Linda and Allie Wakefield, some kids under their care, Becky, and the Edgertons, as I pulled into their driveway. I’m not in Kansas any more and there’s no place like home.